I’m so sorry that my blog reading has lagged lately. I’m desperately trying to get that book draft done for Stanford by the end of the month/year! I promise I will back in the swing of things very soon! 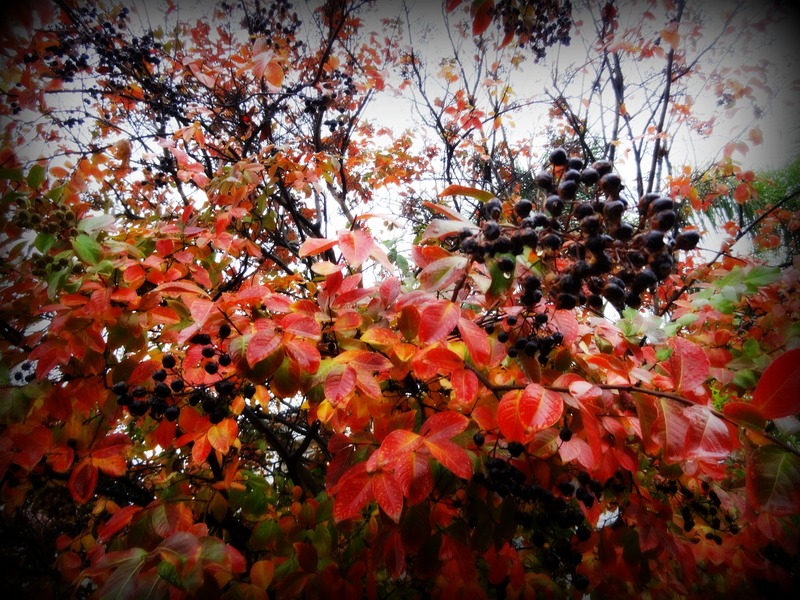 When I was in California last time I saw this beautiful tree with berries. I have no idea what kind of tree it is. On the long and boring ride (through the desert) back from California, I suddenly remembered my pet peeve. Usually when people talk about pet peeves, I agree with some of what they say, but not all. But I don’t usually think in terms of having a pet peeve. Until I realized I do have one. It’s when someone borrows a book from me and doesn’t return it! Gah, I really hate that. When I was a kid I had two Judy Bolton books. Do you know what those are? They are like Nancy Drew, but way better. Judy was a redhead with two cute boyfriends (sometimes at the same time). The books were written by an actual writer, Margaret Sutton, not a team of ghost writers (like Nancy Drew and Hardy Boys). A girl in my neighborhood who I had a very short-lived friendship with borrowed one of my two JB books. I had already read it twice, but loved it. She didn’t return it. I started to get very anxious about the book, and eventually my dad went over to her house to ask for it back. There were only children at home when we got there, and they refused to let my dad in the house, although he was very insistent. I never did get it back. It wasn’t replaceable as the book, I’m pretty sure, was out of print. It had been one of my mother’s books. When I was in junior high I listened to John Steinbeck’s Travels with Charley (memoir or fiction? that would be another post!) read (by whom, I can’t remember) on the radio and loved it. So when I was in high school I selected his Grapes of Wrath. Although the book was dark and sad, I loved it and loaned it to the boy who sat in front of me in history class. He refused to give me the book back. His backyard backed up to my neighborhood and I used to go by the back of his house and throw it dirty looks. Much more recently I loaned (against my better judgment) my copy of Marni Nixon’s autobiography to my piano teacher. I LOVED that book as I have been a long time fan of Nixon’s. She was the singing voice for Audrey Hepburn in My Fair Lady, Deborah Kerr in The King and I, and Natalie Wood in West Side Story. My teacher never returned the book. I quit piano. I know this is dumb. Books are just THINGS. People are more important than books. Anybody else this nutty about their books? Please ‘fess up. So much to say here, Luanne. First and foremost, so glad you’re back blogging.Second, I have one daughter who is exactly like you when it comes to her books. She loaned one to her sister’s friend over a year ago but she was a pitbull about getting it back, constantly harassing her sister and – lo! – she got it back last week. Last, you have taken piano lessons as an adult? That’s so cool – good for you! I’d like to know how you organize your time so effectively to get so much done. You’re amazing! S, I will be “coming back” slowly. I still have much to do on that dang draft, but I also am coming to peace with the idea that it will be very very very very very very very very rough and that that is ok because if I get it too firmed up when she rips it apart it will hurt more ;). Good for your daughter! hahahaha yes ,you have to be a pitbull to try to get a book back from people! 🙂 I did take piano lessons. I even got to the point where I could play one musical theatre song that I considered very difficult (humongo chords) quite well. But when I quit I regressed so quickly that it is scary. There just isn’t time (as you know) to do everything one wants to do! I learned very young that “loaning” books was like donating them. Friends would desecrate them with Coke spills and sticky hands if I would ever see them again at all! I would make up excuses like “my Mom won’t let me loan books.” Now there are so few books that I want to keep forever that I encourage loaning. For a really special book I don’t want to loan, I just say, “oh, I have the Kindle version.” Guess I never really learned to share. Kate, well, I was an only child for eight years, so I didn’t learn to share with siblings. So that might be at the root of this in part. But from a logical perspective, I don’t understand why people who wouldn’t dream of taking something else of equal monetary value from you have no qualms about not returning a book they have been told that you love. Ugh, still holding off on Kindle over here ;). When I lend a book to someone, I think of it as a giving them a gift. Most of the time, my loaned books do not boomerang back to me. Rudri, I don’t get that at all. An expression like Mi casa es su casa is meant to be hospitable, not to be taken literally. The same thing with loaning a book. And particularly when the person asks to borrow the book! I have quite a few books that mean a lot to me. I go back to them, to re-read, to show to someone visiting, to look up passages, etc. I don’t think it’s somebody else’s right to decide what book I don’t need back, especially if I don’t push it on them. Also, books are expensive. People wouldn’t dream of taking something else of similar value, so why do so many people think it’s ok with a book? And what do I say if someone asks to borrow a book I seriously want back? Luanne, I feel your pain! I’ve loaned books and not gotten them back. And, of course, the book(s) always seemed to be some of my favorites. I’m cautious about lending them nowadays. Exactly! It’s always the best ones! So curious. I also will be very cautious because telling someone how much you love a certain book does not mean that person will give it back! Jill, I still haven’t gone for the Kindle. You are saying something simlar to Rudri above. If I don’t want to say goodbye to a book, how do I tell the person? If I say how much it means to me they don’t care and won’t return it. People seem to think books are fair game to hang onto, pass on, or throw away. And I guess certain types of books I feel that way about, too, although no matter what type, I hate that feeling of remembering a book and wanting to dig it out and realizing I don’t have it any more. It’s one thing if it was a library book, but if it ever was part of my library, it’s different for some reason. Maybe it’s just selfishness. I’ll never give up paper books, but I do love my Kindle, especially to read while exercising or in bed at night. If you express to the person how much the book means to you and you really would like it back and then they don’t return it…I’d be returning that person to the “nice of have known you pile” because that’s just rude. And no, you’re not being selfish. Hah, thanks, Jill! I love your idea ;)! I never loan books – I still have a niggle about the Stephen King book I loaned to a friend when I was 17 that I never got back – not an irreplaceable book by any means, but the fact I never got it back obviously left a lasting impression! Andrea, oh, that makes me feel great that you feel the same way–and remember that loaned book! It does leave a lasting impression when you feel let down! For a few minutes this morning, I was thinking that it’s similar to how my daughter and her friends “share” clothes and rarely return them to each other, but we are talking about BOOKS, after all, not mere clothes! Absolutely, Luanne. Nothing peeves me more! So I no longer lend; instead I recommend 😋. For awhile, I’d put my name on a ‘please return to’ post-it inside the book and keep a record of who had which book. But I couldn’t quiet my anxiety that one of my favorites wasn’t on my shelf. Favorite books are so much more than pages and cover; I’ve decided to be a better protector of that part of my heart. Sammy, I’m so happy I am not the only one and that we both go through this, although I’m sorry you get anxiety over it. I was mentioning to Jeanniebottled (another Michigander BTW) that I also get anxiety if I borrow a book from someone else! Oh, yes, I never borrow books – too much pressure (self) to get them read and returned!! It’s either library or purchase for me! As a fellow devoted reader and bibiliophile, I understand how you feel. What I cannot get past, though, is that you love Judy Bolton more than Nancy Drew. Blasphemy! Nancy is by far the best girl detective. Period. Hahahahahaha. How dare you, Lisa?! 😉 I do love Nancy. She’s my alter ego. Neverthless, Judy Bolton books are much better written than Nancy Drew books, and the characters really come to life when you’re reading. Sorry, Carolyn Keene/Mildred Wirt Benson! Books are SO much MORE than “just THINGS.” My books are my best friends and my solace. And it seems that it’s always my favorites that I loan and then never get back. I once loaned “Peace is Every Step” by Thich Nhat Hahn and “Something Beautiful for God” by Malcolm Muddridge, stating, “These are my two favorite books. Peace is Every Step is like my BIBLE. I really need them back when you are done with them.” The person I loaned them to was someone I respected a great deal…is now a published author too, someone I figured would respect my request. Nope. At the time I was also working pro bono on a conservation project and had ZERO income and was living very frugally. Very recently I was looking in my neighbors’ library for a Henry Miller book and stumbled across my long lost copy of “Big Sur and the Oranges of Hieronymus Bosch” that I’d picked up at the Henry Miller Museum in Big Sur on my trip to Baja from Canada in 2002. I’d JUST replaced it when I found myself once again in Big Sur last year. Ha! Dawn! You found your book among a neighbor’s books?! Oh man, I would be making a VERY sarcastic comment! Oh man, I hope he/she enjoys it enough to make it worth the “theft.” I love Thich Nhat Hanh!! Yes, it makes me mad. I loaned a book (that I hadn’t read yet) to a woman in September and she has not returned it. On the other hand, a different woman loaned me a book in October, and I haven’t read it yet….or returned it. How’s that for reverse instant karma? I have had a couple of times like that myself. They were when someone loaned me a book when I didn’t have a way to return the book without mailing it to them (if I even had an address). The stress of having someone else’s book was too much for me. I also keep other people’s books in baggies until I can give them back. I had placed my own book in a baggie…..
That is a good idea. I wonder if people outside of Michigan use the term “baggie.” Or is it ziplock bag? Or something else? I am so sorry you have lost some of you treasured books to people you believed you could trust. This is what I do, and it may help someone else. If someone asks to borrow a book, I tell them books are my friends, and I will allow my friend to visit for awhile, but because I will miss my friend, I need to make sure I know when it is coming home. Then I ask if one or two weeks would be enough time to read it. Based on the answer, I next set a date for us to get together for coffee or lunch, and the return of my book. I know it is controlling; however, I have no longer lose books to careless people. Hah, I love it. Yes, controlling, but they are your books and you want to be in control of getting them back and I do not blame you at all! What a wonderful, well-thought out plan! If I love a book, I won’t give it away. I often give a gift of a new copy to someone, but the one I love is MINE! Of course, I also never expect money back when I loan it, which is why I rarely do that, either. Yeah, sometimes I give a new book as a gift because I don’t want to give up my own copy, although I did want to give someone a book I love the other day. She’s got cancer and a surgery coming up and I thought she might like this cool book I have and I CAN’T FIND it. For some reason I want to give her my own copy, so I will keep looking. Yeah, that would make me part with it. Hope she does OK. Thank you. All prayers and vibes welcome on her behalf!! I don’t think I could do that! I’m not a hoarder, but maybe I need those hoarder helpers with my book collection! Isn’t that something though that they can print a copy of a book you want like that?! That is so cool. OK, maybe I am. Thanks for making me fess up! I’m not, but I get why you would be. Sure they’re “just” books, but they are yours! And now I want to read about Marni Nixon. Oh man, I have wanted to write about that book so many times, but ALAS I don’t have a copy ahem. Gee, maybe I’ll write about it anyway. I love Marni Nixon . . . .
Good to ‘see’ you, Luanne! Glad you’re (I’m assuming) making progress on your WIP. I’m a bit weird with books. Because I read in bed (and I’m MORE than a bit weird about clean sheets – my husband swears he wasn’t allowed to put his head on my pillow the first two years we were married, which I think is a slight exaggeration) I don’t favor used books. Any used books get read elsewhere. Nothing grosses me out more than coming across a squished bug or pizza smear when I flip the page. And I don’t break the binding on paperbacks. And I certainly don’t dog-ear or fold pages. I have no problem passing on 99% of the books I read and I want them passed on to others. But that precious 1% that I keep because the author and/or text is so special? The only person I’d lend it to is one that is more precious to me than the book – which reduces the chances of me committing a crime if it isn’t returned in the condition it was sent out or not at all! Shel, this was absolutely hilarious. When i get like this dear hubby calls me Howie-Ann, relating me to Howard Hughes ;). And I so get it! Ugh. I’m ok until I start to think about all the germs on the book . . . . And squished bugs in books. The worst. Never used books in clean sheets. No. Thank you for this very honest, very real, and very funny account of why we need NEW books! Still, it’s a valid pet peeve and I still get a little “itchy” when people just assume I should loan them a book rather than they get their own copy. Marie, you’re so lucky people took you seriously and returned your books! Labels are a good idea. I have book plates, but only use them for my hard cover books because of the expense. And when do I ever loan out hard cover books? They aren’t the sort of books I talk about in an excited tone of voice! My great-grandpa’s old books, my mother’s old books, the hard cover series hubby ordered . . . . Yes, itchy is a great word to describe the feeling when you just know they aren’t going to return the book or will think you are weird if you insist you need it returned! I loan books all the time, but I think of it as gifting. Certain people, a handful of people, I’ll loan to with the understanding (display of pedantic neuroses) that I MUST HAVE THE BOOK BACK. No one has failed me yet. But, the books I don’t loan live in my bedroom, where no one will bother them, let alone ask to borrow one. Hahaha, I’m never gonna think of it gifting. Gifting is something that I give willingly, not something somebody pretends they will give back and don’t intend to. That’s a nefarious intent, if you ask me. 😉 Well, with one exception. If it’s a cultural thing to not return loaned books, then that would be acceptable. And maybe it is and I NEVER GOT THE CULTURE POINT MEMO!!! Yes, returning my books honors me. If you don’t want to return my casserole dish, that’s fine. Just remember that next time you have a broken leg, you won’t be getting another casserole from me because I don’t have a dish to cook it in. Oops, sorry, that was something else I remembered. No way is a casserole dish as important as a book, but it does seem dishonorable not to return one when somebody goes out of their way to cook and bring food to you when you are sick. Who knows, though, the label with my name on it might have come off in the dishwater . . . . Anyway, back to the books, which are so much more important and harder to forget who loaned it to you ;). Someone borrowed my mother’s first edition Harry Potter and the Sorcerer’s Stone. Her kid tore it up and she replaced my mother’s copy with a Scholastic paperback and gave that to her instead. Now, THAT, is a bloody crime. NO. Really? Oh man, that is a horrible crime. Was she that ignorant? YES. Also, thoughtless and greedy. I remember the first time I watched Out of Africa and heard this quote, Berkeley: “We had a friend – Hopworth – he’d got a book from Denys and didn’t return it. Denys was furious. I said to Denys, “You wouldn’t lose a friend for the sake of a book.” He said, “No, but he has, hasn’t he?”” And I knew that was me, I have fogotten many thngs and people in my life but never those who have not returned my books… Great post! Ailsa, this is the most perfect quote ever! So apropos here! Thank you so much for this. I hope people check out your blog and your cause! Thanks for stopping by. I’ve had people ask to borrow books from me and I flat-out say “No.” With a smile, of course 🙂 The main reason I don’t loan books is because I tend to write in them. They become really personal, almost diary-like with my thoughts scribbled in the margins. If it’s a book I really didn’t like or didn’t care much for, then I might lend it. But not a book that’s important to me. Rachael, that’s a fabulous reason, though, not to loan books. What a good excuse. I’m not good at writing in books. I have in a few, but mainly I can’t bear to do so. It also feels too personal to me–and that is something I should ponder. Why do I feel that way about a book? Odd unless I expect others to borrow them. Thanks so much for weighing in–and on my side, too ;). I don’t think you’re being nutty at all Luanne! The people who took your books and didn’t return them are being really rude. (And I say that, but I’ve been guilty of not returning a few books myself, lol) Especially the one who didn’t return your mother’s book. That’s just plain low down. I’m with you on not being able to read my blogger buddies posts as much as I would have liked lately. It’s a busy time of year, so hopefully everyone understands. Happy New Year! Faith, so funny! Gee, I hope I haven’t never returned a book, but then what if I have? And then I’m griping about others hahaha. That girl who didn’t return my mom’s book really triggered this whole book thing, I think, but looking back as I peered into the house from behind my dad, I’m not sure they could have FOUND the book in there LOL. Have an absolutely wonderful and blessed New Year, Faith! So, I think that’s a Sambuca or Elderberry tree…but who knows. I always think Poison Ivy is gorgeous in the fall :). So did we ask about book crazy or the lag in blogging? Hmmm…she looks off to an indefinable far away point…I’ve had neither the time, nor the inspiration lately. And I’m admitting it. Here. I’m not sure why. sigh. As for book crazy? I saw the coolest thing on Pinterest a couple of months ago. It was a planter for voluptuous and fascinating succulent plants (quite the hipster thing these days with all their endless variety) made from an old book. You simply open up the book to a halfway point, carve out the center of several pages –a good 1 or 2 inches deep–and preferably facing a snazzy old illustrated page. You then plop a little bit of damp sphagnum moss into the hole and arrange your baby plants snugly together. Viola!! Fashion. Haute decor. Elegant and trendy simplicity! I have now dragged home countless .99 cent old books gleaned from thrift stores that I have NO interest in reading. I cannot bring myself to defile one…not a single, solitary little page. Again…sigh. These days I buy few books that people want to read – mostly poetry and oddball nonfiction titles – and if someone wants to read something I have, I’m more likely to find a copy and present it to them than I am to act as a lending library. The popular fiction I buy from time to time generally gets recycled at a local thrift shop. I’m picky about who even touches my books. I’m not weird. I’m just, uh, peculiar. Yeah, that’s it. I think it’s a good idea to only loan a book you don’t particularly want back. It is better to just give it away or else get another copy for the person requesting it. I admit I don’t like germs on my books, so I actually think you’re not even peculiar, Robert! Having owned a used and rare bookshop, I’m not too concerned about germs on the books (they haven’t killed me yet), 🙂 but I agree that it’s best to loan books that you don’t want or need back. Less stress, too.